Midwife Martha Cade has decided. When he returns in February, she is going to marry Mayor Thomas Dillon. That is the only decision in life in which she feels confident these days. 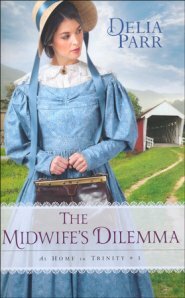 Everything else around her feels like it's changing too fast, from her daughter's obvious affection for the town's young doctor to Martha realizing she's ready to pass on her role as midwife to someone younger. Even her beloved town of Trinity is changing. The 1830s Pennsylvania town, having mushroomed in size and population, is becoming an important agricultural and economic center for the region, and soon a canal will connect it even more to the outside world. It is a season that will set the course for the rest of her life. Martha will need every ounce of confidence, courage, and faith she possesses to overcome the obstacles that will make her life far more challenging and difficult than she can dare to imagine. Purchase the book HERE. Delia Parr is the author of seventeen historical and inspirational historical romance novels, including Hearts Awakening, Love's First Bloom, and Hidden Affections. The mother of three grown children, she was a long-time high school teacher in southern New Jersey before retiring to Florida.